That Willow Whipper bird sang its very repetitive song all night long. I felt like I got about two hours sleep. It was so loud. 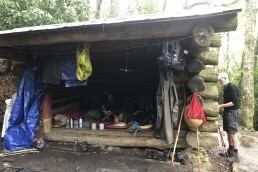 Occasionally it would move off to a different tree and annoy the campers but most of the time it felt like it was in the shelter. I woke up exhausted. Plus Sunnyside (who I’ve been calling Sunshine something) his alarm went off at about 5:45am and he snoozed it. One of my biggest annoyances. People sharing a space snoozing their alarm. He didn’t get up. In fact everyone else in the shelter got up, ate breakfast and packed up and he was the only one still asleep in the shelter. On a more positive note, I didn’t notice any mice. 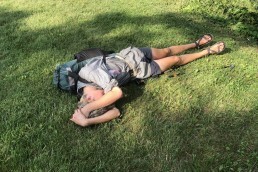 It was about 8 miles to a camp store where I was planning to resupply and get some food. The trail was a bit different this morning, some open areas with a couple of views and some big rocky areas to walk through. Then it went back into the trees and that’s the way it stayed. There seemed to be a lot of people camping up on the hill which I think was an official campground, I could see lots of motor homes and RVs through the trees. It was overcast and so much cooler today than it has been. I was on a single mission to get to the camp store. I needed a poo. I had tried to go this morning in the privy but it was almost full and the smell was so gross I couldn’t spend the time I needed in there. And my left knee was in a lot of pain today. No idea why it’s suddenly started hurting now when it’s been ok for ages. On the way I finished the audiobook I have been listening to – Sharp Objects by Gillian Flynn, it’s absolute crap, avoid at all costs. However I was listening to it on an app called Scribd which is a monthly subscription app at $8.99 and you get unlimited downloads of ebooks and audiobooks, so much better than Audible, and the first 30 days is free. By the time I was at the camp store my knee was getting more and more painful, so I was glad to get there. I went straight to the bathroom and dropped off the kids, there are coin operated showered there but I’m not carrying a towel so I passed up on that. I bought a soda and had a wonder around. There was the usual stuff for resupply but it was all much more expensive as I expected it to be. I went to sit outside where there were a few other hikers milling about. The lady told Supermoon that the wayside was just a half mile down the road and they sold hot food. She said she was going to walk there and I decided to go with her. 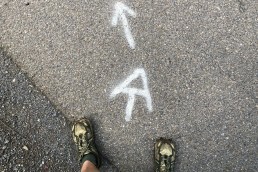 There was a side trail that would rejoin the AT. When we got there a couple of others were already there and said the breakfast was good. It was about 10:30am. I didn’t really want a breakfast so I decided to wait until 11am when they served their lunch menu. I mooched around the shop. It was a bit of a mistake to not resupply at the camp store. The options here were very limited. In the end I bought a Gatorade and a bag of crisps. And I also picked up a Shenandoah patch! We sat and chatted to a family who were at the shelter last night. I was talking about my cycle across Australia last night and they assumed I was Australian. He gave us the rest of his homemade beef jerky which was nice. I ordered chilli cheese fries which was a mistake. I bought there were going to be fries topped with chilli con carne and then topped with cheese. Wrong. It was about 7 fries topped with chilli sauce (no meat) and cheese that looked like it had been squirted out of a can. I ate it because I was hungry but it was not that enjoyable. After hanging around a bit longer Supermoon and I decided we were going to walk on Skyline Drive instead of the trail this afternoon. Quite a few people have been taking the road. I wanted to do a bit of road just to give my knee a break. It was really struggling on the sharp downhills. Every time the trail crosses skyline drive it descends sharply. So I would take the road which parallels the AT, so it’s the same number of miles, more or less. Plus, the people who have been walking the road say there are a lot more views than on the trail where it passes through wooded summits. It was really nice to be able to walk without pain in my knee and without kicking a rock every 5 minutes. It was nice to have someone to walk with and chat to. It was nice to be able to walk side by side. It was a nice temperature, I had actually started to get a bit chilly at the wayside and I had got my puffy vest out. I even hiked in it for a bit until I started to get a sweat on. It was nice to walk at a reasonable grade and not have to look down at your feet the whole time. It was nice to not feel enclosed by the trees and have so many views out over the valley. I have absolutely zero regrets about taking the road instead of the trail. It was an altogether much more pleasant experience and only doable because of the cooler weather. If it had been a hot day with clear skies it wouldn’t have been nice to walk on the road. We had gone about 6 miles and came across Big Lots sat on a grassy patch taking a break. We joined him and I ate a few crisps and sipped a bit of Gatorade. There had been some water sources on the road but because of the weather and the lack of sweating uphill you tend not to drink as much. I set off with him to do the next part of the road and it was the same nice stuff all over agin and now I got to get to know another person. This time we stopped and picked and ate the black raspberries from the side of the road. They were really good. And we, I say we, Big Lots spotted a bear on the side of the road up in the forest. He was a beautiful bear probably around a year old because he was only small. Big Lots also scared the crap out of me when he pushed me out of the way because he saw a snake, but it turned out to be roadkill. It drizzled a tiny bit but not enough for raingear, and the tops of the ridges where getting covered in cloud, which is what we would have been hiking in as we stayed on the AT. After about 7 miles we took a break and I had to go take a wee because I was bursting. Not a lot of places to go on this scenic drive. When I came back I noticed I had a tick on my finger and I flicked it off as quick as I could. Gross. That was the first tick I had seen. I was super paranoid after than and I kept looking all over my legs in search of any more. I think I am safe. Supermoon caught up to us as we were sat there, and we were sat next to an AT crossing. A guy who took the trail and left the wayside the same time as us came down the trail. So we hadn’t cut any time or miles, I had just saved my knees from ruin. The three of us continued road walking together which broke my day up so nicely. A few hours by myself. A couple with Supermoon. A couple with Big Lots. Then a couple with them both. At 25 and 26 years old they were moaning about their ages and they guessed me at 28/29. Happy with that! We stoped to fill up our water from a stream and then we rejoined the AT to search for a campsite. It was about 0.2 up the trail and we found it easily. The path continued on and Big Lots went to have a look. He called to us to come and see and he had found an old graveyard. The first stone I saw said BABY 1932-1932. Then there were other gravestones. One for a 6 year old and one for a 60 year old and some which were just marked with simple crosses and some dents in the ground which were unmarked graves. It was all a bit creepy, and just about 50 feet away from where we were about to pitch our tents. We got set up and I ate some crisps and an apple pie which I had been carrying for too long for dinner. We all hung our food together, and Big Lots did the bear hang. We were done and in our tents by 8pm. Lying down by 8pm was such a treat and just in time for it to really start raining. Hopefully the rain will just stay light and hopefully it will clear up overnight so I don’t have to pack away a wet tent. Although I am doubtful about that. It’s 9:20pm now and I might get my eyes shut before 9:30 tonight! It’s not warm.